The purpose of this web page is to providing information concerning our home and place of business Slab City USA. We have spent winters here since 1985, enjoying the mild winter climate of the Southern California Desert, and selling and installing lots of Solar Panel Systems. The last eight summers we have chosen to stay and enjoy the summers here as well. In order to tolerate the heat we have installed a 2.2kW solar system on our main residence and expanded our office solar system and shop solar system as well. There are no utilities here but ample sunlight. Water and groceries are available at the nearby town of Niland CA 3.5 miles west of Slab City. This is a quiet ad hoc desert community with winter daytime temperatures averaging somewhere in the high seventies and very little rain. Although the mild climate originally brought us here it is the wonderful, adventurous, creative full of life, people, that keeps bringing us back year after year. Slab City is located in Imperial County, in South Eastern California , about three and one half miles East of the Town of Niland. From hwy. 111 you turn on Main St. East. After the railroad tracks Main St. seamlessly changes to Beal Rd. as you drive towards the Chocolate Mountains in the eastern horizon. After about 2.5 miles you can't help but look toward the right and admire and wonder at the sight of Salvation Mountain. A few hundred yards past Salvation Mountain up a slight rise on Beal Rd you get a better look at the creative campsites of this low desert community. You will see all kinds of desert living here. Some people have tents, converted busses, trailers, campers, motor homes, I know one person who made a temporary swimming pool in a dry wash. One of the nice things about this place is that as long as you are not bothering your neighbors you can park and set up your desert camp anywhere. Once you are here stop, rest, and get to know your neighbor. They are likely to have a lot of adventures to share. Good chance they will share their interests and maybe by a camp fire. Who knows maybe a guitar will show up with some one behind it playing and singing music. You will not only be likely to find the kind of music and entertainment you like but in the winter lots of other activities are available. I know people playing cribbage, Poker, dominos, stained glass, paintings, line dancing, clog dancing, and a couple of regulars have ultra light planes they fly over the desert on calm days. If you are a single person, one of several singles clubs might interest you. These clubs offer all sorts of opportunities for people to get to know and enjoy each others special interests. Off shoots of these clubs also get together and enjoy activities such as off road vehicle tours in the desert. Some of the non club sponsored activities at Slab City include weekly non denominational worship and potluck dinners. Builder Bill has organized what he calls The Range with live entertainment by local entertainers sundown each Saturday. If you are in the neighborhood, and see the lights on, swing on by Slab City USA. Maybe you can contribute some of your ideas and talent while enjoying this great desert community. Speaking of talent if you continue on Beal Rd all the way to the end it intersects with County Road AKA Coachella Canal RD. From there take a left just until the road bends to the left and hang a left on Rattle Snake Canyon Rd. one block to East Jesus. East Jesus is a community dedicated to making art. There you will see all sorts of art projects from art cars, sculptuers, towers, most make from discarded material. From my shop I regularly walk over and enjoy the creativity that constantly changes on a daily and weekly basis. These folks do a great job of turning junk into treasures. 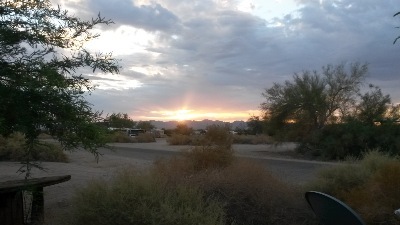 Slab City is a community changing all the time, seasonally and yearly. We have a population of all races and socioeconomic class. This fact is what makes it one of the most interesting places to visit and live in the country. Everyone seems to get along. If you decide to spend some time here remember that their is ample space to park so you don't have to pull right up next to the campsite next to you. You can set up your camp anywhere rent free and if you respect your neighbor you will get the same in return. Leave some room and consider the fact that they might like to enjoy the desert without having to listen to your personal conversations, tv, radio or generator. Speaking of generators over the years Slab City campers have come to realize that when it comes to generating electricity solar panels are easier, more reliable, more economical, as well as less noisy. I think on a per capita basis Slab City could have one of the highest percentages of solar powered residences in the country. I have been selling and installing solar panels here since 1986 and I would be happy to help you with your electrical needs by installing a solar electric system. You can enjoy the quiet of the desert with all the comforts of home. Pack it in pack and pack a little extra out. A lot of people don't but you don't have to be one of them. I have found over the years that if you set an example in this regard others will follow.